This 8" lift kit features 8" front Pro-Ride Coil Springs and solid upper long arms and tubular lower long control arms. The long control arm reduce caster change through wheel travel creating a more controlled feeling in the steering wheel both on and off road. 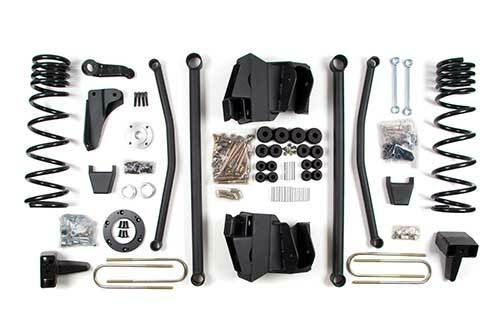 All four control arms are greasable for long term performance. This 4-Link long arm lift kit retains the factory triangulation of the arms as well which adds to the stability of the suspension system. A dropped forged pitman arm is included to maintain the factory steering angles. A track bar relocation bracket is included to properly center the axle under the vehicle. Extended bump stops and sway bar links are included to maintain the OE characteristics. The rear of the Dodge Ram is lifted via 5" block kit. Measure rear axle tube before ordering. Some 4" axle models with dual overloads will require part #4068. Rear lift options will not fit dually applications. 102009 Rear brake lines will not fit 2012 models. Additional front driveline modification may be required. Exhaust modification will be required for dual rear shock kit 122009.